My husband and I visited Paris for the first time for a week at the first of September. Here is our lovely Paris itinerary in a nutshell. 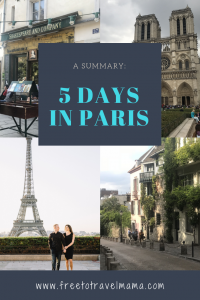 If you would prefer the more detailed version with our commentary, line skipping tricks, money saving tips, and more photos, you can find our Ultimate 5 Day Paris Itinerary Guide here. Arrival at CDG: We arrived in Paris at 8:00am on a Wednesday morning. We followed the “train” signs and purchased tickets and hopped on the RER B to the St. Michel stop about 45 minutes away. We loved the geographical convenience of staying in St. Germain. Explore St. Germain & Latin Quarter: We visited Saint-Sulpice Church, St. Michel Fountain and the gorgeous Luxembourg Gardens. We grabbed a quick panini from one of the many quick eat boulangeries. Notre Dame: Entry to the cathedral is free and lovely. If you would like to climb the towers I highly recommend the Je File Duck the Line app which allows you to save a place in line. We entered the gate on the right for Square Jean – XXIII for gorgeous post card views of the backside of the cathedral. Sainte Chapelle: Lines for security can be lengthy. Don’t forget to go upstairs for the real display of stained glass beauty! Afterward, we rested our feet in the little park around Sainte Jaques tower. Seine River Cruise: Book tickets online to save with Vendettes du Pont Neuf. We took the evening cruise departing at :45 after the hour. Sit on the top left hand side of the boat to get the best view. 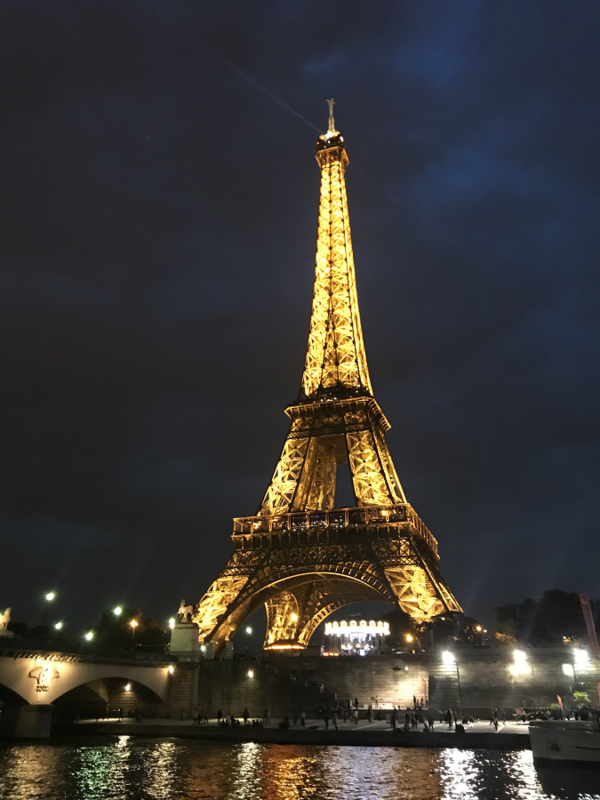 We approached the Eiffel Tower and had front row seats to see its sparkling performance on the hour. Explore Versailles: We decided to avoid the crowds by arriving later in the day and only visiting the gardens and the Trianon. If you would rather head out early and see the palace too, you can check out a few other tried and true ideas for skipping the lines in a new post coming up. We entered on the left of the Palace. The landscaping of the gardens was breathtaking. The area called Little Venice offers tram rides, golf cart rentals, bicycle rentals, and rowboats for a float around the canal. In order to rent a vehicle, you will need to leave an ID as a deposit. 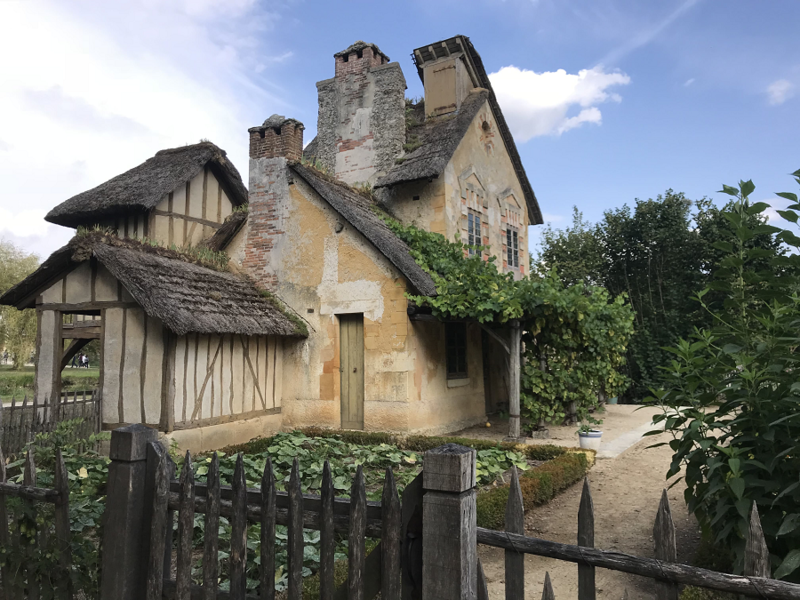 Trianon and Queen’s Hamlet: We made our way on foot toward the Trianon to the Queen’s Hamlet – the quaint little peasant village created by Marie Antoinette. I wish we would have packed a picnic and spend the entire afternoon. Musée du Louvre: We hopped on the train back into Paris to rest our weary feet. After a quick freshen up at the hotel, we took our crazy selves on a walk over to the Louvre. I would not necessarily recommend doing the Louvre and Versailles in one day! 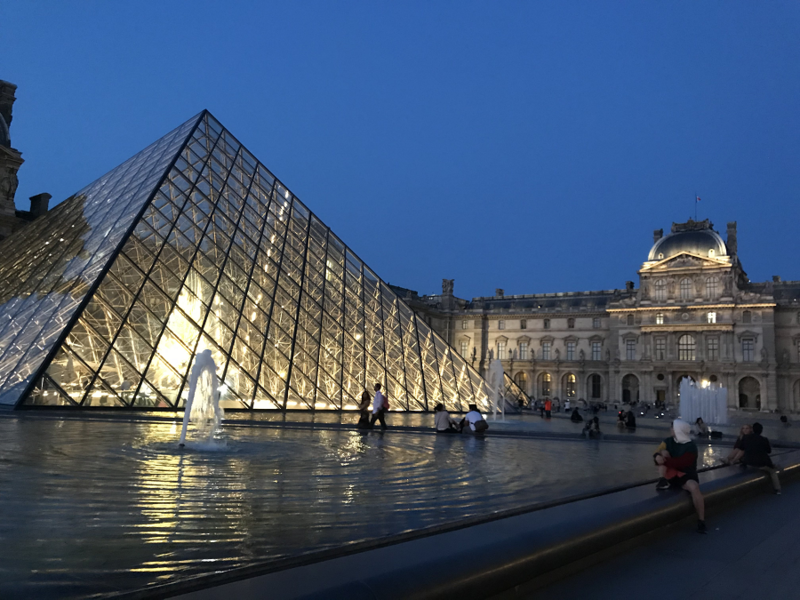 However, it was Friday which was late night at the Louvre – it didn’t close until 9:45pm and we really wanted to take advantage of a few hours at the Louvre without lines and crowds. We entered the Louvre in the early evening without a person in front of us to hit up some highlights for a couple hours. When we exited the monumental museum, the outdoor exhibit of beauty took our breath away. We loved our evening relaxing in the courtyard with the glowing pyramid and surrounding impressive architecture. 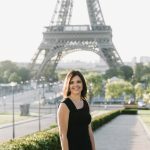 Sunrise Photo Shoot at the Eiffel Tower: We met our photographer, Olga, with Flytographer at the Eiffel Tower at sunrise. Trocadéro is a lovely spot with gardens and an ideal view of the Eiffel Tower at any time of day, although nothing beats sunrise. Olga made our session a comfortable and fun experience for us from beginning to end. We are in love with our images and will always treasure the experience. You can see my full review of our complete Flytographer experience here. Explore the Eiffel Tower: We did have to go through security to enter the area, but since the elevator to the Tower opens at 9:00am and it was only 8:30am, there weren’t any lines yet. It is only €10 to climb the stairs to the second floor rather than take the elevator, which we think is a great experience! 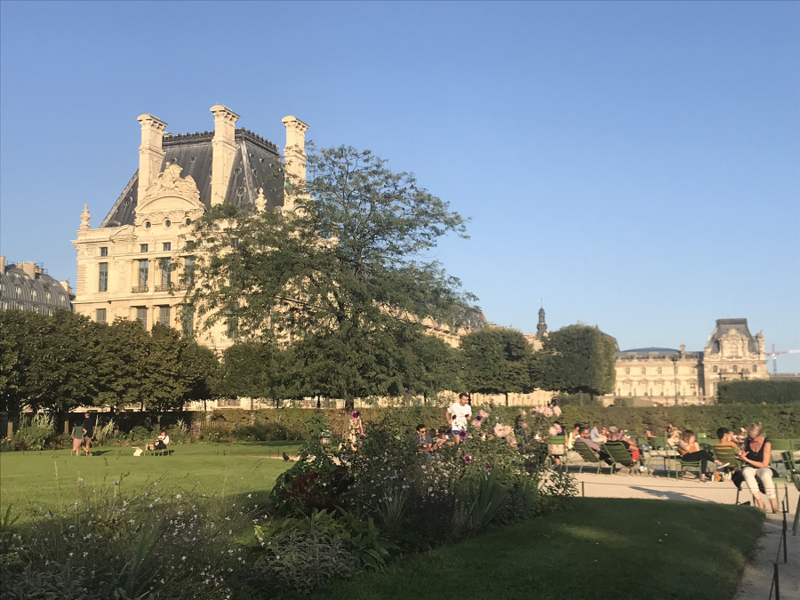 Tuileries Garden: We decided on a late afternoon self- guided walking tour from our hotel in St. Germain all the way to the Arc de Triomphe (about 3 miles). We walked through the courtyard and out to the beautiful Tuileries Gardens. We soaked up the Parisian sunshine with many other tourists and locals alike. Arc de Triomphe: The street is muuuch longer than it appears. In hindsight, we would have paid a few euro to the one of the pedicab drivers to save our feet. After a tasty dinner at Pizza Vesuvio, we arrived at the Arc after dark. It is necessary to go down the steps of the metro to follow the tunnel under the street to reach the Arc. We climbed the 284 stairs fairly easily and the view from the top was beautiful. We loved that the skyline included the Eiffel Tower-unlike the view from the Eiffel Tower. 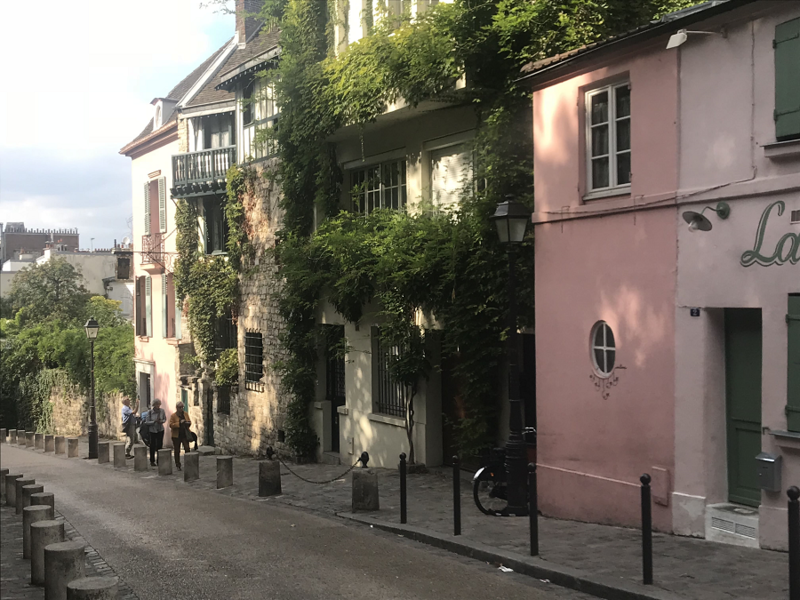 Shakespeare and Company & Choux Pastries: We set out on our last walking tour by heading toward the Seine River again to visit Shakespeare and Company. This quaint store with its low beams, thousands of worded treasures, and upstairs reading nook was well worth the stop. Well worth the quick stop, Odette’s is next door and the vanilla and chocolate choux pastries were delicious. Place des Vosges: We took the 20 minute walk across the Seine River and then northeast a few blocks to Place des Vosges. We grabbed picnic supplies at to enjoy in the park neat the fountain. Montmartre: We rode the metro to the Abbesses station in Montmarte. You can ride the funicular up the hill, but we chose the stairs (by accident!). The top of the hill afforded nice views over the city. Place de Tertre did not disappoint with its square filled with artists and their wares. We enjoyed the cute street of Rue de l’Abreuvoir and noted where Renoir used to live. Sacre Couer was lovely from afar but we chose not to go up the steps. 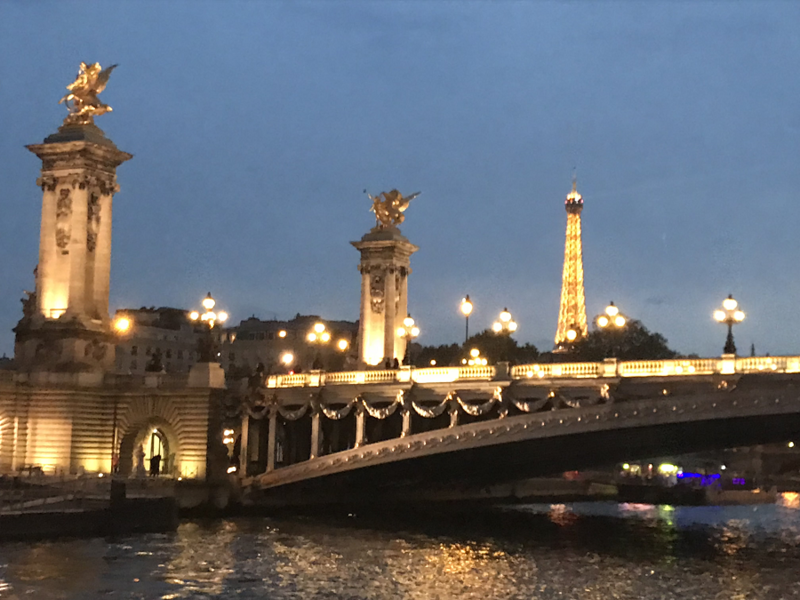 Last Evening in the City of Lights: We had steak and lobster at Les Pinces and another rose-shaped gelato cone from Amorino’s. We loved staying in St. Germain, filled with so many iconic cafes, happy, laughing conversations, and walking distance to almost everything. We took one last stroll down the busy streets and absorbed the lively activity and beautiful buildings glowing with light and love. Au Revoir, Paris! We will be back. This looks an a perfect itinerary! Thank you! We had a fabulous trip! What a beautiful trip! It sounds like you all the major spots! 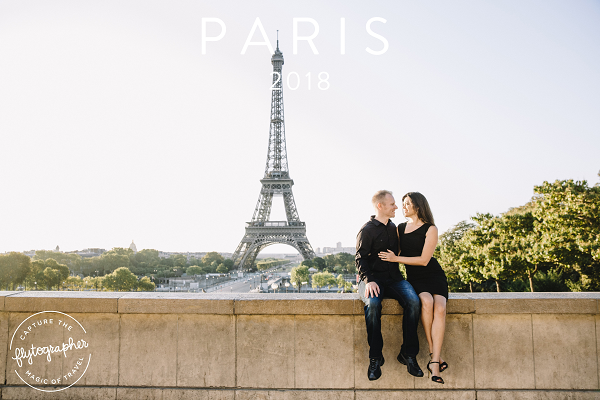 We visited Paris last year and also did a photoshoot with Flytographer. We are so thankful we did. Your photos are stunning! Thank you! 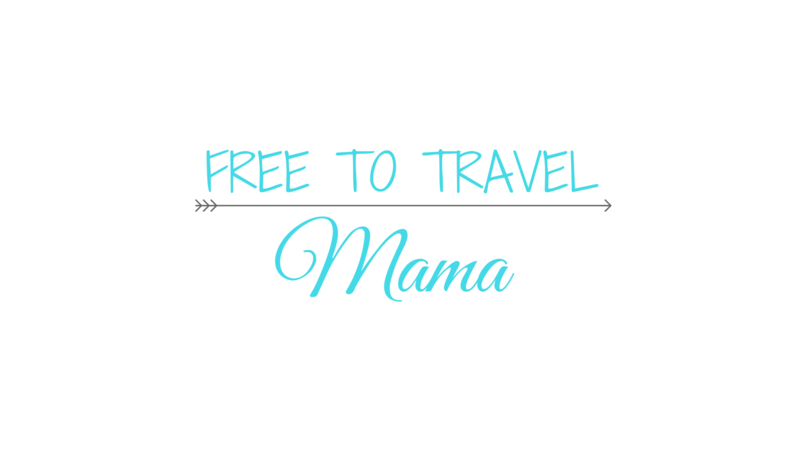 We loved every moment of our trip! We lucked out with very mild temps the whole trip and managed to avoid lines everywhere as well. I would love to return in the autumn someday too! Reading lots about Paris at the moment and it’s making me want to go back. It’s a city I used to visit a lot in my early twenties (a few decades ago) and I loved reading your itinerary, with your lovely photos. It took me back to visiting with my husband! Your itinerary hits many of my favourite spots including St Germain and the Latin Quarter, Saint Chapelle and Monmartre. I think Paris is a city whose appeal never wears off! I could return over and over again! This is the first time I heard of the Queen’s Hamlet. This looks so incredibly cute. I love the thatched roofs and how quaint everything looks. I absolutely love the European countryside and look for ways to escape the cities. The Hamlet was amazing to experience. Such a neat piece of history that often goes unnoticed in the shadow of the Palace. That looks like the perfect Paris itinerary I have seen. You have covered all important places in and around. And that Flytographer experience looks surreal. What amazing pictures. I must definitely arrange with them to take my pictures at my favorite destination. Thank you! It was truly a fabulous trip and our photo shoot was such a highlight! I highly recommend trying them out. Such wonderful souvenir to bring home! Thank you for the feeback! We really hate standing in line while traveling so always seek out tips to avoid that. We are so glad to hear how our tips and tricks can help others too! Paris is never a bad idea. Always love the city. Been there a couple of times but never got the energy or will like you guys to do a morning shoot. Guess that will be #1 on my next year’s trip. Thanks for sharing this detailed post. We loved the city too! So gorgeous! I am so glad that we agreed to schedule a photo shoot at sunrise. It we had just planned on going on our own at sunrise, we would have never gotten out of bed! But we are glad we did – sooo worth it!